Tiffany & Kiu share a little dance as the sunlight flares off the Vltava and surrounds them in warmth during their photo session in Prague. Who is the best pre-wedding photographer in Prague? What does it take to be the best Prague pre-wedding photographer? It’s not just one thing, but a variety of different things that would lead one to select who they feel is the best photographer. Truth is who is the best is a very subjective: some couples may wish to have the dark moody desaturated look, while others prefer a brighter cleaner, more elegant style, while others shoot pictures of couples simply standing and looking in to the camera without a thought to how the images are to look before and after processing. Irregardless of the style of the photographer that you chose, first and foremost; the photographer must be technically proficient and be able to create different styles. The photographer must be able to truly see a scene & compose a beautiful photograph irregardless of the light, and to do that many times throughout the coverage of your photo session. Though it sounds easy it really is not. The photographer must be able to capture beautiful, creative moments such as the one above that happens very rarely. How often have you seen an image such as this one? And lastly, the photographer must truly understand Prague and know what are it's best times to shoot and more importantly where. Technical ability of the best Prague pre-wedding photographer. First of all your Prague photographer must possess unparalleled technical ability. The photographer must be able to create a proper exposure, understand color theory and how to maximize the unique contours of light. He or she must be able to assess the light levels and choose a proper shutter speed to freeze or blur the movement, choose an aperture (f-stop) to emphasize depth of field, and combine those things with an ISO selection. Those three items together make up the exposure, and to be the best Prague pre-wedding photographer, one must always get all three correct every time he or she clicks the shutter. Whether you’re indoors or outdoors, in bright light or darkness, the photographer has to be able to make a correct decision on f-stop, shutter speed, ISO and yes, Kelvin (color temperature) and yes, for every single frame! Five hundred images may be created during a typical photo session and each one truly matters. 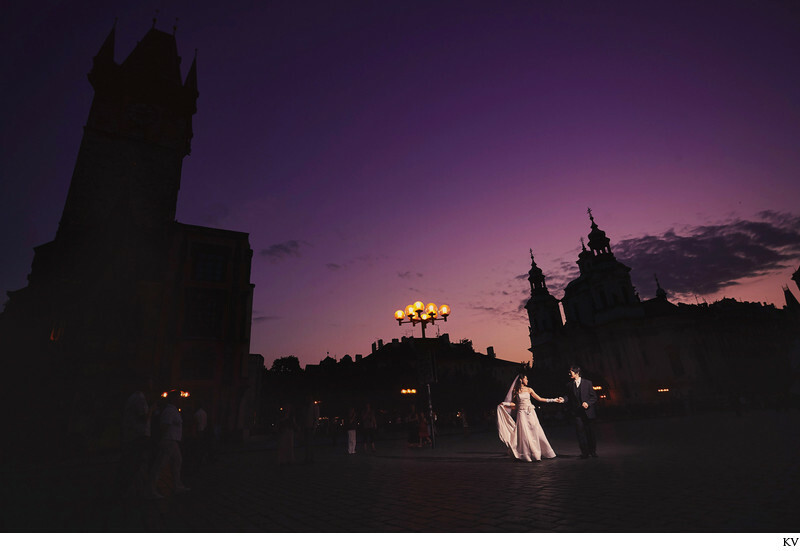 The Prague pre-wedding photographer must also be able to compose an image properly. What does composing an image properly mean? It means that the photographer has included elements in the frame that helps tell the story he or she is attempting to document. If there are too many details (or too busy, or noisy as we like to say in the industry) this will detract the viewer’s eye from what the photographer is trying to convey. Are there too few details, not enabling the viewer to tell what’s going on in the photograph? 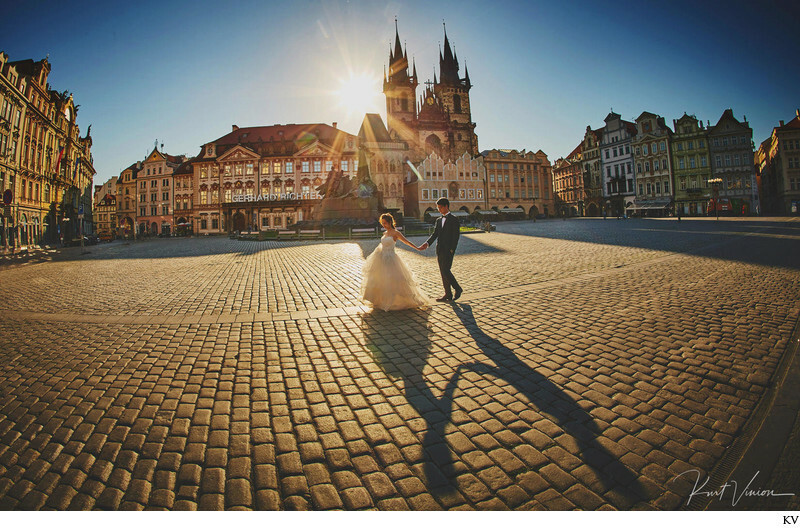 To be the best Prague pre-wedding photographer, one must be able to assess a compositional scene as quickly as he or she assesses the elements that make up a proper exposure. Even to an untrained eye, it’s easy to tell if a photographer is gifted at the art of composition or not. Take a look at the above photograph - where does your eye immediately go to? And does the rest of the frame help tell the story? The gas lamps, the color popping in the dark sky, the lace framing a couple as they embrace behind a parasol? Are there distractions (such as people) that cause your eye to look away at the couple? What about this image? How quickly does your eye got to her smile and her eyes? The best Prague pre-wedding photographer also understands his or her gear, and knows how to maximize its uniqueness. We’ve already talked about how technical expertise means choosing a proper exposure for any given situation. We’ve also discussed how the composition of the elements in an image results in either a powerful shot, or doesn’t. The best Prague pre-wedding photographer also understands how focal length helps convey the story and the feeling in a photograph. Do they favor a wide-angle, almost distorted viewpoint to push the eye of the viewer in a specific direction? Does he or she favor a longer focal length, compressing the background and creating a foreground and background relationship that is pleasing to the eye? What about depth of field? Do you prefer an image with a very soft background or do you prefer an image where everything in the frame is in focus? Which image truly tells the story? This is a decision your Prague wedding photographer takes every time he takes a picture. For example in this image above? An untrained viewer shouldn’t be thinking “Hey, I wonder what that focal length in that photo was”. The viewer should be moved by the content of the image. The truth is, the technical aspects that go into creating an image are the photographer’s decision, and the results of those decisions are the emotional connections the viewer feels with the image. The best Prague pre-wedding photographer understands Prague! Another thing that would set apart the best Prague pre-wedding photographer from all the hundreds of other Prague photographers is the ability to capture a moment. This is something that is very hard to learn. Sure you can 'run and gun it' as is popular with many young photographers where they take thousands of photos in hopes of having a beautiful selection, but who really wants to look though thousands of images for those real gems? Technical skills can be learned through proper education. You can also practice at different lighting scenarios (indoors with candle light, or a dance floor with laser lighting are quite difficult for many upstart shooters). A photographer can work hard on their usage of off-camera flash, or on-camera flash (which looks quite terrible and really is unacceptable in this day and age), or portraits with a video light that create depth and a style. Over time, you can hone your technical abilities but truth is this takes lots of experience and dedication to craft and lets face it – when you are investing money in to a photo shoot the last thing you want is for the photographer to be experimenting on your time. Truth is, the best photographers are ones who are well versed in any lighting situation and can create something beautiful no matter what. In this day and age there are simply no excuses anymore why a photographer can not bring back a beautiful moment – in any situation. Over time, you can hone your technical abilities. Yet, it’s very difficult to hone intuition. I truly feel that a photographer can either anticipate a moment and capture it, or he/she cannot. The best photographers are usually the ones who can anticipate the moment. This takes skill, dedication and an extreme focus on what is occurring. Experience will help with those things, but not as much as a natural ability. Capturing a moment can be so fleeting that it’s almost gone before it even takes place. Sure you can ask the couple to redo that moment during their portrait session but it is really not the same things now is it? So who is the best Prague pre-wedding photographer? Truth is this is subjective and as such there really are no correct answers. 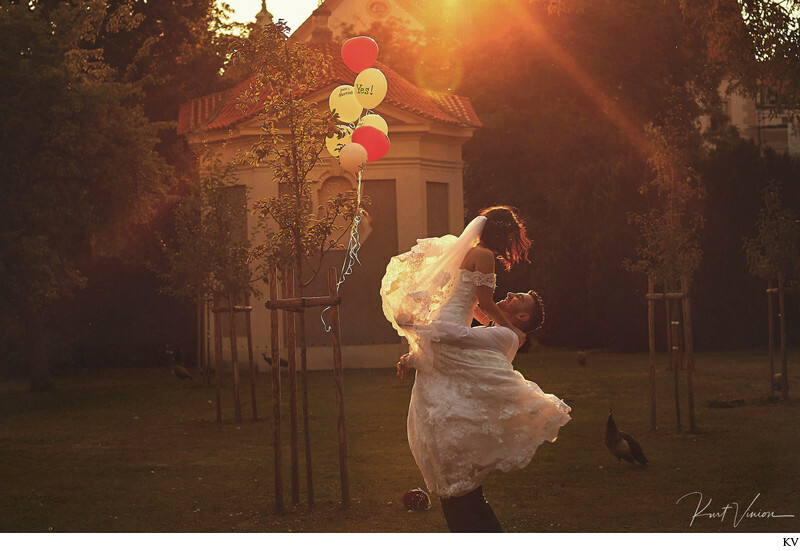 Yet, I can humbly say that yes, I am one of the best Prague pre-wedding photographers! Though I really am quite humble in my demeanor I can back up this claim with many reasons. For one, I am technically proficient in all areas. I can work in bright sunlight, from morning to night. 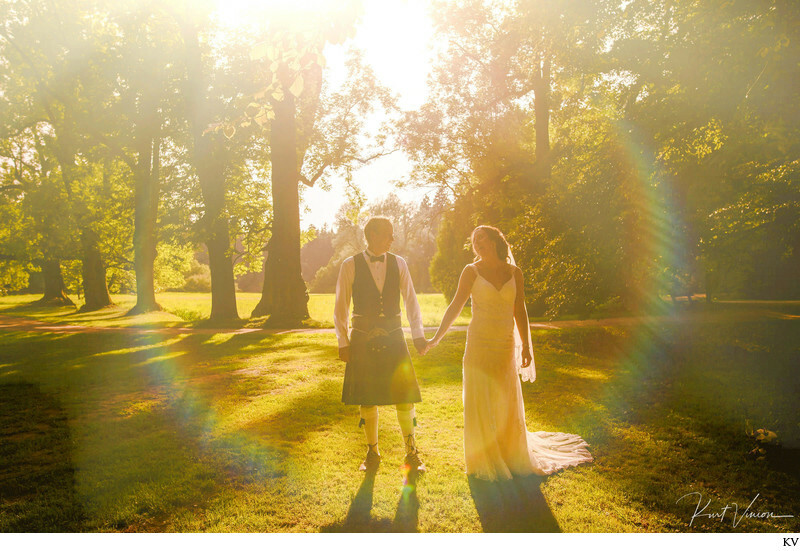 I can create outdoor portraits and capture outdoor wedding scenarios whether it’s early in the morning, in the bright light of high noon, at sunset, and even in the darkest of the night. I can shoot as well outside in the sun as I can inside a dark candle lit reception hall at midnight. Whether working with flash, video lights or natural light, I am equally technically capable. I understand how to use light and lighting modifiers, know Kelvin and I know when natural light isn’t enough to capture a scene how to add that little bit of something extra to make it work. I can make flash look like natural light, and vice versa. I know when to use a flash, when to use a video light, when to use multiple flashes, and when to use a studio strobe. I can create a proper exposure in any and all scenarios that I could possibly find myself in on a wedding day. I can shoot in the crazy heat of summer, the freezing blizzards of winter, and in the pouring rain. These things might not sound like much, but it’s imperative that your wedding photographer be able to handle him or herself in any given situation. I can do that. I also am extraordinarily proficient at composition. I understand how to arrange the elements in a photograph to tell a story. My background as a photojournalist and a magazine photographer means I am very versatile, experienced and can beautifully create in any situation. That is not bragging – that is merely a fact. And yet as a photographer, as an artist and a human – I am still striving, pushing my boundaries and pushing my art. I will never tire of trying new things or pushing myself to realize new ways of capturing and seeing things. In short, I will always look for ways to capture moments, beautifully and artistically. I believe that I owe it to my clients to constantly educate myself no matter how long I am in business. Another thing that separates me from many others is my ability to anticipate the moment. I simply love this aspect and this is truly what separates gifted and talented photographers from those who are simply taking pictures. Having studied photojournalism and then working as a sports photographer at the University of Louisville and then later as as sports photographer for the wire services has provided me with a unique education that my peers simply lack. It is this training that separates me from many other Prague wedding photographers. Truth be told, if you see the moment in your viewfinder and then take the picture there is a very good chance you will have already missed it. This is whay anticipation is do critical to good imagery and this means that the photographer is really focused on that moment. When a potential client tells me that they are moved by the feeling that is expressed in my images I know that I am doing a good job. Keywords: couple in love (102), fine art weddings (99), Gold (15), Golden Light (93), Prague Wedding Photographers (87).